In the spring of 1939 war is on the horizon. Clara Vine is living in Nazi Germany working as an actress but that’s not the only thing she’s doing. She is also there to spy on the personal lives of top Nazi leaders for British intelligence. Each day that Clara remains in Berlin is a day closer to war and should she be caught, she would be in grave danger. Suddenly, someone close to Clara is found murdered. The victim is Lottie Franke, an aspiring costume designer and student at the prestigious Faith and Beauty finishing school that trains young women to become the wives of the Nazi elite. While the press considers Lottie’s death the act of a lone madman, Clara uncovers deeper threads, tangled lines that seem to reach into the darkest depths of the Reich—and to a precious discovery that Hitler and his ruthless cohorts would kill for. 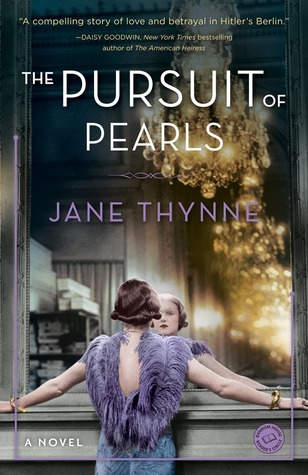 This book is marketed to fans of Jacqueline Winspear and Susan Elia MacNeal. I would say that’s a pretty accurate fan base. I found myself thinking this was similar to both authors but this book was a little different for me. One of the first things I noticed was this book is deeply set in the Nazi Reich while the other authors primarily focus on Britain as a setting or backdrop. The backdrop/setting for this book was really really interesting. I guess I never stopped to think about what German culture was like during the years leading up to the WWII. So I was immediately sucked into the German cultural world that this novel highlighted. The Faith and Beauty girls were an interesting organization and while many of the historical aspects of the novel might not be completely ‘accurate’ I was super interested in it nevertheless. I would have read this book for that reason alone! Very well done and engaging for readers! I haven’t read any of the other books in this series and for being four books in, I didn’t feel that lost in the story. The author did a nice job at helping the reader navigate previous events, however there were a few times when I felt like there was something I was missing for example, I wondered if there wasn’t more to the relationship between Clara and her sister/family. I felt like maybe there was more that I was missing from previous books. However, on the whole I felt like this book could easily have been read as a standalone. There was part of me that felt like the murder mystery part took a little too long to develop. The murder did happen very early on in the story which I appreciated, but personally I felt like it took a while to get into the murder aspect which I found a little frustrating. Having it happen so early made me want to start investigating right away but instead more emphasis seemed to be put on getting all the characters into their positions within the story. That said, I really enjoyed reading this one and felt that the premise and mystery were both interesting and adequate. I liked the spy angle of the story and found it very intriguing and believable. This was a fun murder/spy mystery novel that could be read as a standalone but would obviously be enriched by the previous novels. It takes you somewhere completely different and adds a unique perspective to the story having it set in Nazi Germany so I would encourage readers to give this one a shot!